CANADIAN REGION: What are you doing February 2017? Re: CANADIAN REGION: What are you doing February 2017? I couldn't find this thread. For some reason it found its way under "Everything Else" so I moved it to the Canada regional forum where it belongs. Sorry about that, TD. As I was leaving the next day and it was still January I could not find where to put it so I dumped it in Everything Else. Thanks for putting it in its rightful place. Anyway, this morning is just beautifully sunny and calm. Now our forecast is two days with some sun and above freezing during the day, with sub-zero temps at night. This is followed by two days overcast but now snow, a little rain and similar temps. Then four days of cloud and rain but day an night temps above zero. If this is correct, then no snow shovelling for me in the foreseeable future. Still lots of snow on the ground so the beds will be protected and I am hoping it will melt away in time for the beds to warm up. I cannot see if the garlic or tulips have poked themselves through yet as the snow must be about two feet deep there. Another 13 days and according to my predictions, I will have the first sun shining on my garden at the far corner. I should amend that statement, as the trees that have been felled on the boundary between my next-door neighbour, has let in some early morning sunshine on the beds directly in front of my house. There's even a video on ANSFG. And how about growing summer squash vertically. Not much going on in my garden itself. This morning had some freezing rain and was not able to take my garbage can down my drive to the road as it started getting out of control. So I managed to stop and then get back up to my car port as I did not relish having to haul it all the way back. After two weeks I still only had two grocery bags of real garbage so it will have to wait another two weeks before that goes out again. Most of my stuff is recycled and I have far more of that than I do of real garbage. I think I will go to City Hall and see if I can get one of the smaller bins; I should have done that when they were installing all the bins last year. The fruits of procrastination. I am still waiting to see if there is anything growing under all my snow; garlic and tulips for sure. Maybe some carrots to harvest if I can find them. The snow should start melting soon as tonight should be the last of the sub-zero temperatures, at least for a few days. Spring will soon be here and then we will forget about it all until next winter. We have just passed our ten hours of daylight mark. Stewart McLean, a wonderful Canadian story teller, died from skin cancer today at the age of 68. Here he is talking about a carrot and drinking water. He will be missed. Great talent, gone too soon. There are things I need to get done such as starting onions and leeks indoors, winter sowing, arranging my grow light shelves, doing more microgreens, etc. But for some reason I seem to be stuck. Just can't get myself going. Need a kick in the pants. I checked my 2016 Calendar to see what, if anything, I was doing this day last year..
creeping buttercups in the wood chipped walkways. They came up easily with at least ten inch roots. This year I will not be doing anything as the garden is still a foot deep in snow and we had some more fall this morning. I think we were getting the top end of California's rain that had turned to snow. the forecast is rain for the rest of the week. Still lots of rain/snow for the next week. Daytime temps above freezing and the night time temps below so it is going to be mucky weather for sure. Yesterday, as the snow was clearing from some of my pots just under the car port, I rescued three little pots with cuttings in them and they look as though two, mabe all three, have tiny swelling buds; if so then they must have put down some roots and are likely to survive. All I know about them is that one day late last spring, I was walking Downtown and passed by a small bush absolutely full of glorious smelling pink blossoms. I had to take a step back and stand there just absorbing this beautiful aroma. In the fall I pinched three cuttings and stuck them in pots to see if they would get through the winter. Can't wait now to up pot them and for the first leaves to break through. I will have to wait for the Downtown bush to bloom, then try to identify it. We did not see the garden until April and we were anxiously waiting to see what was growing. Apart from grass, the only thing was a tiny clump of grape hyacinth growing on the bank that we could only see from the road. The day after we spied it there, it disappeared and we found a little heap of wilted flowers covering what I think may have been a small creature's grave. Eventually I dug up that little bunch of bulbs and have grown them to cover a patch under the apple tree so now I look forward to them each spring. This spring I will also be looking forward to the new rhubarb and the continual growth of a couple of dogwood bushes plus the garlic and tulips for starters. Been strangely warm here, too. Not sure . The weather is warming up here in Ottawa a bit. The warm winds are making me think of spring, a spring gardening. Remember my herb experiment? It looks like the thyme, mint, basil, lemon grass and Rosemary has survived indoors. I also found a nice surprise: some kale that I forgot to pull out close to to house has survived the winter. I'm in seedling planning phase, and just went through my vast collection of seeds to figure out what I have to start in the next couple of weeks or so. Last year I think I started too early. After a gorgeous sunny day especially laid on for my birthday yesterday, (cough! cough!) I woke this morning to a covering of snow and a week's forecast of snow and snow flurries for the next seven days, so that rules out gardening. 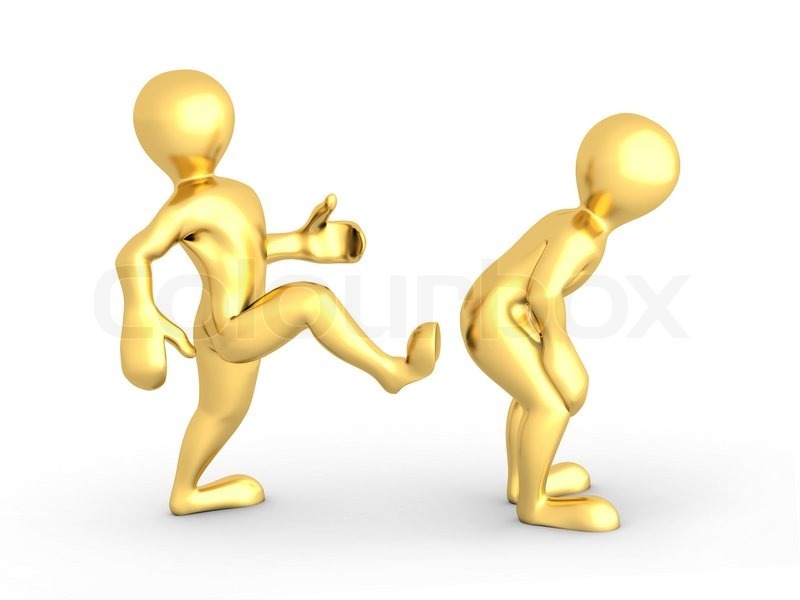 Added to that, yesterday, as I was in my socked feet scurrying round the house getting ready to go out for lunch, I banged my foot on something, then carried on. Returning later in the afternoon, I said to my friend that my foot was hurting, must be the shoes I was wearing. Arriving home and I had my usual siesta and woke up with my foot hurting. It was swollen like a cocktail sausage and I could not put on any footwear except for a sock. Going to bed last night I found a box that I placed in the bed and spent the night with my foot in that box to keep the bedclothes off, and the cat spent his night in a another box placed on the bed. He knew it was not usual and kept his distance thank goodness. This morning my little toe is still swollen and now a dark bruise has formed. The good thing is that I can still walk around the house in my socks quite comfortably, just not able to get any footwear on. I will survive, but I have never had any injury like this that made me sleep with a box enclosing my foot. It always surprises me how such a small injury can alter one's whole life out of all proportion to the severity of it. Think of a cut finger and you are a pianist, or a dressmaker or mixing flour to make cake etc. Kelejan, I like what Sanderson said in the Birthday thread...to tape the toe to it's neighbor. Broken bones can take 6 wks to heal so may as well stabilize it. @trolleydriver wrote: There are things I need to get done such as starting onions and leeks indoors, winter sowing, arranging my grow light shelves, doing more microgreens, etc. But for some reason I seem to be stuck. Just can't get myself going. Need a kick in the pants. TD, I with ya here, buddy. I planted onion seeds but can't seem to get the 6 packs of greens going. @Mimi2 wrote: The weather is warming up here in Ottawa a bit. The warm winds are making me think of spring, a spring gardening. Remember my herb experiment? It looks like the thyme, mint, basil, lemon grass and Rosemary has survived indoors. I also found a nice surprise: some kale that I forgot to pull out close to to house has survived the winter. I'm in seedling planning phase, and just went through my vast collection of seeds to figure out what I have to start in the next couple of weeks or so. Last year I think I started too early. Mimi ... welcome back. Good to hear from you. Kelejan ... Ouch on toe problem. Hope it gets better soon. 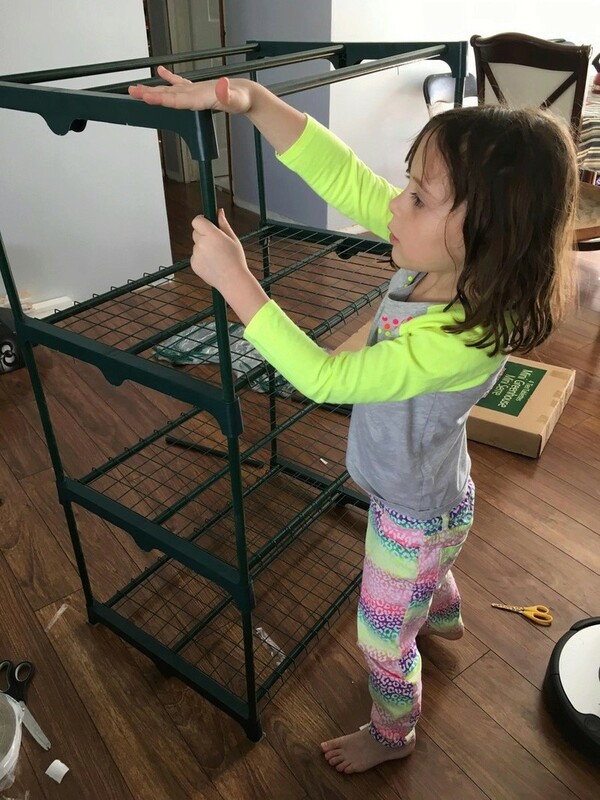 Here is one of our little gardeners helping her mommy put together a plant/greenhouse stand. 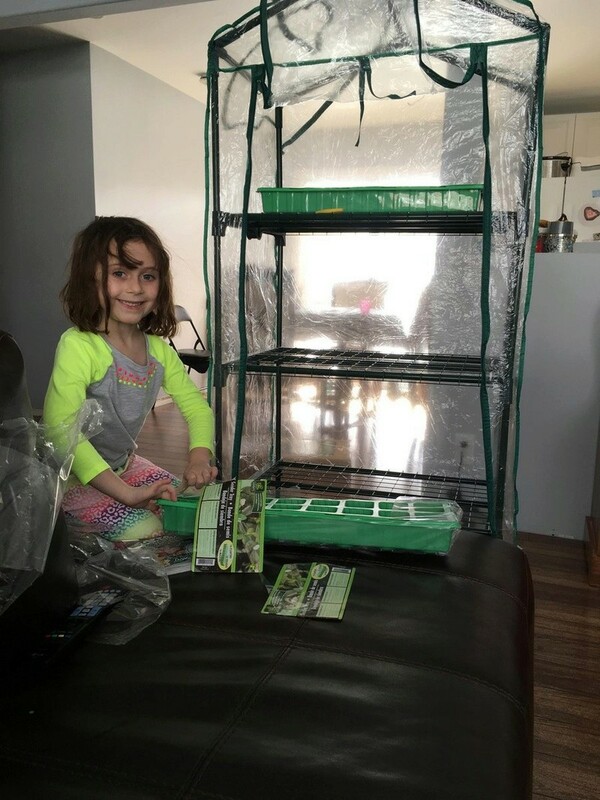 Getting her interested, TD and she will be a little helper all her life. I found that what you learn at that age stays with you. My gardening now is the result of gardening at four years with my dad. Happy memories of the allotment and digging in the dirt and planting potatoes. Of course, I never knew at the time I was helping us to avoid starving as the nation as the "Dig for Victory" posters proclaimed. @Kelejan wrote: Getting her interested, TD and she will be a little helper all her life. I found that what you learn at that age stays with you. She is our youngest grandchild. I also got my first taste of gardening as a child. Even helped a blind neighbour to plant his pea seeds. Cooking and gardening are skills that I a trying to teach my children too. It is such fun, and a real learning experience. Growing life from seeds is a bit of a magical experience too. I want my kids t nourish and cherish life and to feel empowered. Wow, KJ. Staving off starvation is a great motivator for a garden. We had Victory Gardens here, I remember my mom talking about them growing up. And TD....same. Scorpio, I only recently found out the food situation in England by watching the TV documentary, Farming in Wartime England. Sundays with my Dad in the Allotment was a highlight for me. He had a little saddle for me on the crossbar of his bike. While he worked double-digging (I shudder now) I happily played in the dirt or played houses in his shed. We always had sandwiches and a flask of tea. No wonder I am allergy-free. Enjoying all of your comments above.